This charming New Orleans Garden District hotel is located on historic St. Charles Avenue and provides convenient access to the French Quarter, the Super Dome, The WWII Museum, and the Aquarium of the Americas. 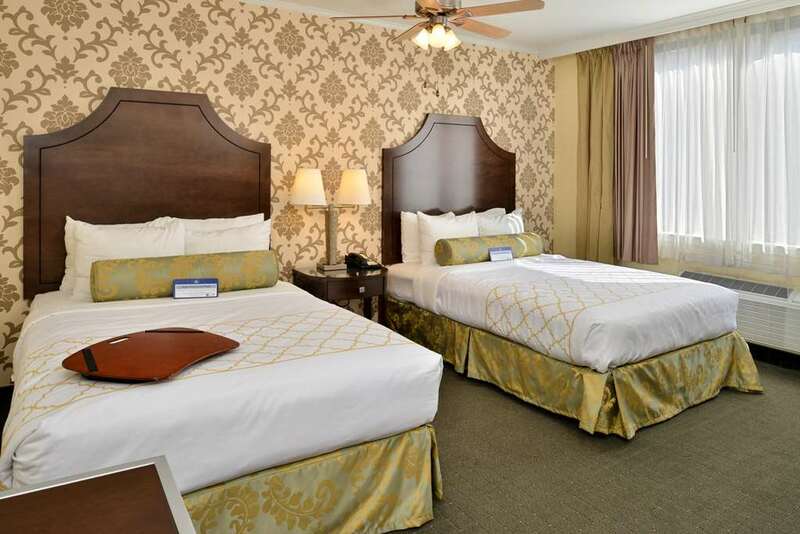 Situated in historic uptown New Orleans near the beautiful Garden District, the Hotel is an easy streetcar ride away from Audubon Zoo and is the closest hotel to Tulane and Loyola Universities. The Best Western Plus St. Charles Inn is the ideal getaway destination. Enjoy convenient access to many local attractions when staying at this Louisiana hotel such as the New Orleans Art District, the French Quarter and several nearby museums. Hotel guests will also be close to a variety of outdoor activities such as biking, horseback riding, golf, hiking and fishing. Each of the 40 well-appointed non-smoking guest rooms comes equipped with cable television and wireless high-speed Internet access. Hotel guests are welcome to a complimentary hot breakfast each morning. Other hotel amenities include a state-of-the-art exercise facility, business center, and free parking. The Best Western Plus St. Charles Inn is conveniently located directly on the streetcar line to provide convenient transportation to other areas of Louisiana. Take a ghost tour of some of the many historical cemeteries nearby or spend an afternoon in the City Park. Families especially will enjoy visiting the Audubon Park & Zoo or the Aquarium of the Americas. Both Tulane University and Loyola University are within one and a half miles of the hotel, making the Best Western Plus St. Charles Inn ideal lodging for those visiting students. New Orleans also hosts a variety of events year round such as JazzFest, Mardi Gras and several major sporting events. Make a reservation today and save at the Best Western Plus St. Charles Inn! Enjoy your stay. August Moon: 0.10 mile(s) from August Moon, Full Service, Chinese, Open for: lunch, dinner, 11:00 a.m. to 9:00 p.m.
Superior Grill: Adjacent to Superior Grill, Full Service, Mexican, Open for: lunch, dinner, 11:00 a.m. to 10:00 p.m.
Coulis: 0.10 mile(s) from Coulis, Cafe, American, Open for: breakfast, lunch, 7:00 a.m. to 3:00 p.m.
From: I-10 East. Take the left exit onto US Business 90 West. Take the Carondelet Street Exit toward St. Charles Avenue. Turn right at St. Charles Avenue and continue to Amelia Street. Make a u-turn at Amelia Street and proceed to the Best Western Plus St. Charles Inn. From: I-10 to greater New Orleans. Once across bridge, exit on Tchoupitoulas Street proceed to Napoleon Avenue. Turn right onto Napoleon Avenue and go to St. Charles Avenue. Make a right on St. Charles Avenue and go 0.40 miles to the Best Western Plus St. Charles Inn. From: I-10 West. Continue onto US Business 90 West. Take the Carondelet Street Exit toward St. Charles Avenue. Turn right at St. Charles Avenue and continue to Amelia Street. Make a u-turn at Amelia Street and proceed to the Best Western Plus St. Charles Inn.